With Green Gobbler, clogged up pipes are a thing of the past. It is the eco-friendly way of cleaning your drain, working instantly unlike other products. Just pour the contents of one pre-measured pouch and add hot water. The formula clears your pipes while pushing out all gunk. You can use it on any surface and for any type of drain, making it ideal for any clogged drain. No more clogged up or dirty pipes! 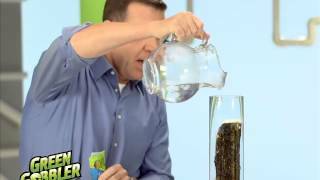 The infomercial claims that Green Gobbler can clean your pipes out instantly after you add hot water. Anthony Sullivan makes a few demonstrations, showing as the product cleans and clears a collection of gunk from pipes. Unlike other cleaners, it cleans out the pipes instantly, while the other just sits there. 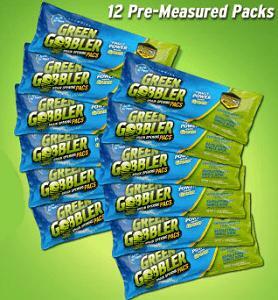 The cost of Green Gobbler is $10.00 plus $6.99 shipping. The special TV offer allows you to receive a second Green Gobbler by paying the extra shipping fee of $6.99 for a total price of $23.98. No measuring cups and no guesswork. Simply empty its contents in your drain and then add hot water. Other cleaners may take a while, but Green Gobbler cleans up those pipes right away, allowing you to use your pipes sooner. Its eco-friendly. No harsh chemicals and no mess. Clean out your bathtub, clear the septic tank,. Even dissolve that garbage disposal. Everything can be cleared thanks to Green Gobbler. No matter if its metal, plastic, or ceramic, the Green Gobbler dissolves garbage without putting holes in your pipes. By dissolving and emulsifying garbage, grease, and grime that has been stuck inside of the pipe. The product is made of a proprietary formula that is safe for you to touch, but it destroys clogged pipes instantly. Its activated by hot water, so you can determine when you need to use it. You dont need to measure it, as it comes in a pre-measured amount, eliminating the worries about putting too much or little cleaner in your pipes. Dispose of the package once contents are poured out. Make sure all of it gets in there, as its measured in one dose. This way, its expelled down the pipes and activated. Works almost instantly. Make sure to use it again when pipes become clogged after awhile. Why Does Shipping Take Weeks? While your product may get there a little early, the placeholder time is 3-6 weeks due to different demand throughout the year. Chances are, you may get your product in less than that, but sometimes demands are high. If youve made a mistake, call customer service and provide your last name, zip code, and phone / email. It will take 24 for it to change. All lies, this product does NOT work. .